WANROOETECH’s newly developed tire or tyre shredder which can shred car truck tires of up to 1200mm into strips and pieces of approx. 150 mm 300 mm. WANROOETECH tire shredders are heavy duty double shaft shredders. They feature additional wear protection compared to other shredders. 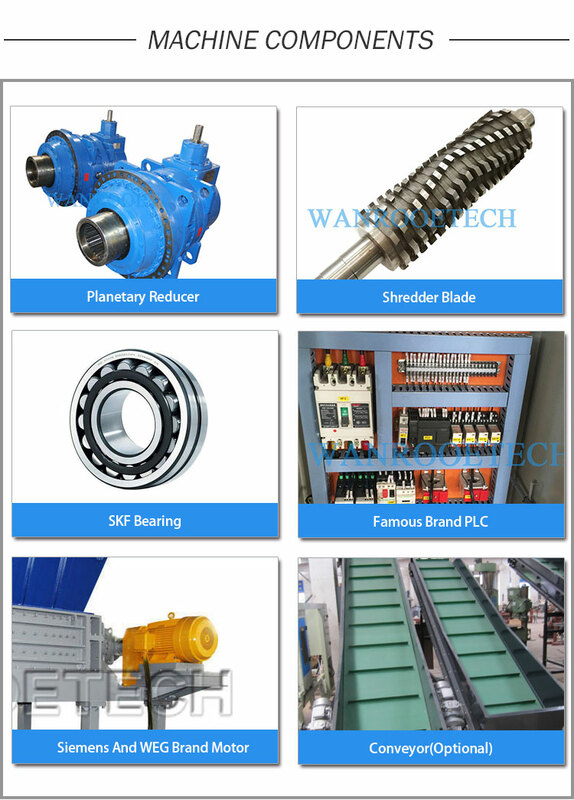 The machine is equipped with a specially designed rotor, made of highly wear resistant steel with added weld on hard facing for longer lifetime. The blades used in these shredders are made from a newly designed, specialized material to ensure long life time and optimal performance, they can reuse again after sharpening. Our PNSS series shredders are discharged by a conveyor belt and transferred to the next second stage tyre shredder or tire crusher. This second stage shredder or crusher is shredding the material into pieces of about 20 mm. This step helps to separate the tire rubber from the steel and fiber. A combination of cross belt magnetic separators and magnetic drums helps to split the various factions at this stage in the process. During metal separation we can take out about 99% of the total steel content. And the fiber also can be separated on another device. 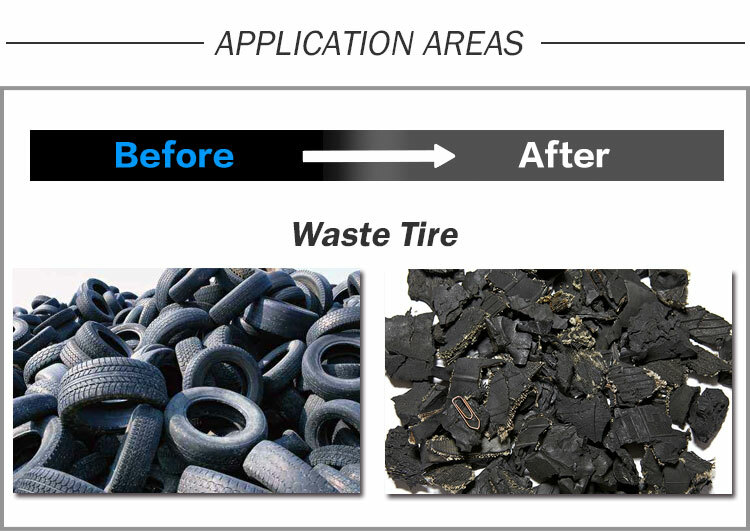 The steel free rubber or tire granule can then be packed and used as refuse derived fuel or transferred to the granulating process, and other applications, such as: runway, School playground, rubber tiles, waterproof material, reclaimed rubber, tire additives, thermal insulation material additives. •Civil Engineering Applications: They can be used as landfill gas trench collection walls, as back fill for road landslide repair, as vibration reducing material for railway lines and as back fill for maintaining walls. •Ground and Crumb Rubber: For example, it can be used in paving projects or be moulded into products. Common examples of rubber moulded products include carpet padding, rubber flooring materials, patio decks, livestock mats, movable speed bumps, sidewalks, dock bumpers, railroad crossing blocks just to mention but a few. •Carbon Source: Instead of using coke or coal in steel mills, rubber can be used as a source of fuel. In fact, studies have recommended that steel mills should adopt burning of rubber as fuel instead of coal, since coal is mined and can be depleted. Using rubber as fuel is a great way for these mills to go green and reduce their carbon fingerprints.